Gougeon Brothers, Inc. regularly engages in testing to support those who use our epoxy in architectural applications, both in new construction and repairs. 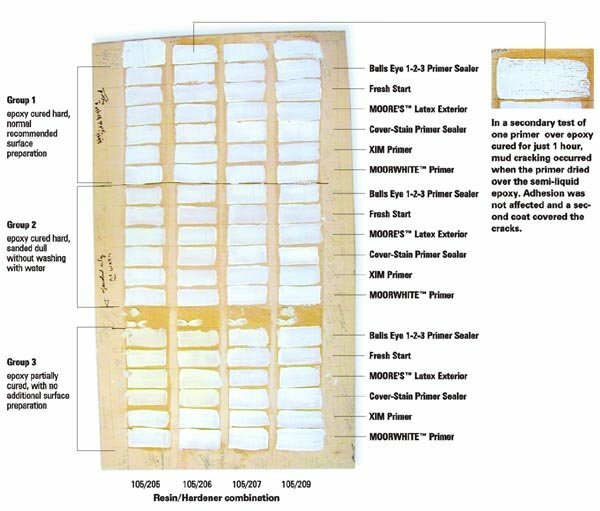 In the past, we have tested the compatibility of house paint primers over WEST SYSTEM® epoxy and found that a variety of primers worked well. Latex primers especially performed well when applied over cured epoxy, even when the epoxy was marginally prepared prior to painting (Epoxyworks 7, Spring 1996). This entry was posted in Materials Testing, Techniques & Tips and tagged 15, adhesion, Epoxyworks #15, paint primer, Spring 2000, Tom Pawlak on September 15, 2014 by ewadmin.